How To Build a Picnic Table | KaBOOM! Adults and children appreciate having plenty of seating areas in and near their playspace. Picnic tables provide seating, which encourages supervision when placed near a playground. 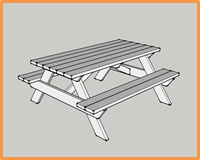 Also, picnic tables provide opportunities for groups of people (families, friends, community members) to socialize and enjoy one another’s company. Take  of the 2x6x12' boards. Cut into  65 ¾" pieces. Take the remaining  2x6x12' boards. Cut each into  72" pieces, for a total of  2x6x72" pieces. Take the  2x6x8' boards. Cut each into  39 ¼" pieces, for a total of  2x6x39 ¼" pieces. Take  of the 2x4x10' boards. Cut into  34 ¼" pieces. Take the remaining 2x4x10' board. Cut into  32" pieces. Take the  2x6x65 ¾" pieces cut in step 2. 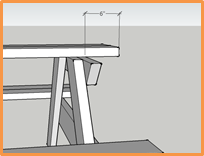 Set the miter saw to 38° and cut an angle off of both ends, creating  2x6x65 ¾" trapezoids. 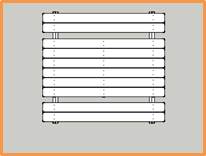 Take the  2x6x39 ¼" pieces cut in step 4. 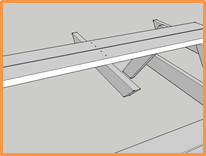 Keep the saw at a 38° angle and cut an angle off of both ends, creating  2x6x39 ¼" parallelograms. Take the  2x4x34 ¼" pieces cut in step 5. 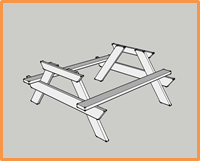 Keep the saw at a 38° angle and cut an angle off of both ends, creating  2x4x34 ¼" trapezoids. Take the  2x4x32" pieces cut in step 6. Set the miter saw to 26° and cut an angle off of both ends, creating  2x4x32" parallelograms. Assemble the A-frame sides as shown. 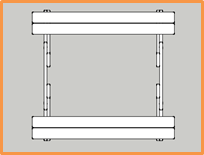 Line up the bottom corners of the 2x4x34¼" table top supports with the outside of the 2x6x39¼" legs. Make sure legs are flush with the top support. Attach with two deck screws to hold in place. 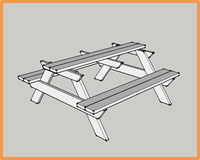 Next, line up the 2x6x65¾" so they are level with the ground, and the top edge extends 12⅛" from the legs on either side. Secure with two deck screws to hold in place. 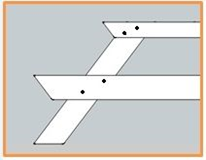 Attach each intersection with carriage bolts: Drill ⅜" holes and use the carriage bolts to secure the connection: keep the bolt heads against the seat and top supports (facing outward) and the washers and nuts against the legs (facing inward on a completed table). Make sure the bolts are staggered as shown. 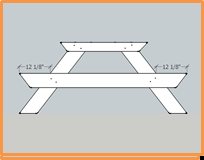 Attach seats: Begin by first standing up the two A-frame sides, making sure the seat supports and top supports are facing outwards and the legs are towards the inside. 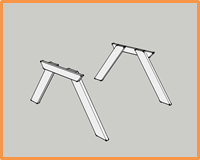 Then attach one (1) 2x6x72" seat on each side of the A-frames, flush with the end of the seat support. Overhang the end of the 2x6 seats 6" past the outside face of the seat support. Attach with two screws. 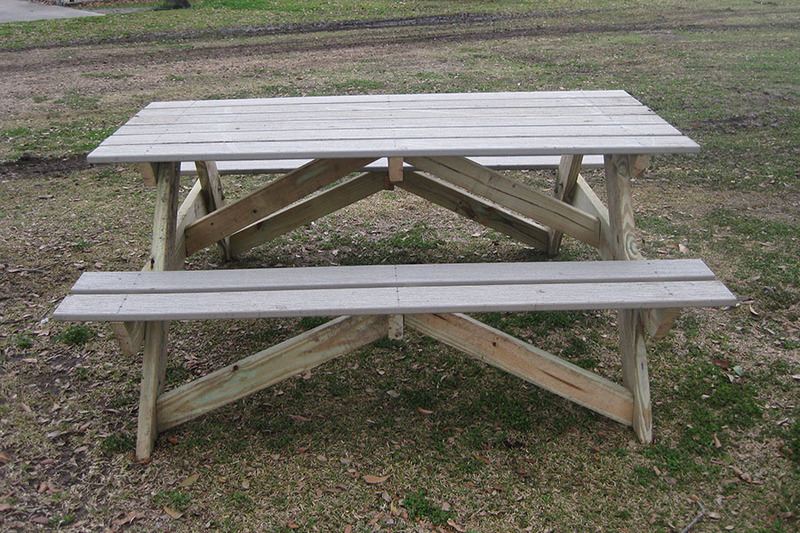 Next, secure the second 2x6x72" seats. Be sure to leave a ¼" gape between them. 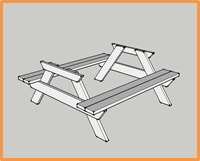 (Hint: Use a pencil to ensure a ¼" gap when attaching the seats with deck screws). 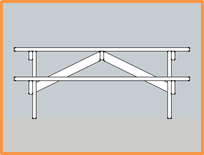 (a) Lay the two (2) 2x6x72" tabletop boards on either side of the table so they overhang the A-Frames by 6". 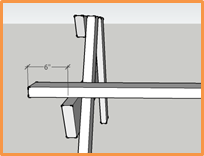 (b) Attach the 2x4x31¼" top support, parallel and centered between the A-frames, with two screws down through the tabletop boards. 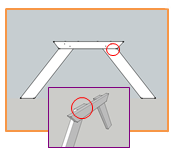 Then install the diagonal 2x4x32" braces flush with the center tabletop support and the seat supports (stagger slightly as shown in "Top View"). Attach with two screws at either end. 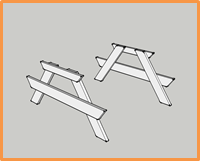 Attach remaining tabletop boards: Install the remaining 2x6x72" table top boards with two screws on either end, ensuring that they extend beyond the A-frames by 6" and have a ¼" gap between them.